On January 7, 1978, an article that was published in an Iranian daily sparked the Islamic revolution, three decades ago. The article scorned landowners who were trying to reverse the Shah's land reforms and mocked how in their desperation they had tried to get the clergy on their side but only one suspicious Indian born cleric had taken up their cause. The article explicitly named Seyyed Rouhallah Khomeini aka 'Indian Seyyed' as the backward reactionary cleric from the dark ages who, fifteen years earlier, had unsuccessfully tried to oppose the land reforms and women having the right to vote. Two days later, Khomeini's supporters and seminary students in Qom marched through the streets of Qom and demanded other Grand Ayatollahs to condemn the article and issue a fatwa to kill the author. The Shah deployed his troops and it is said that six of the protesters were killed. I remember clearly reading about the crackdown in the newspapers, which included a picture it claimed was of seminary student protesters covering their faces and chanting with their raised fists. These protests continued and escalated and in less than a year, the likes of those seminary students I saw in the picture printed in the newspaper, had taken over the power in Iran and our lives changed forever. On 9th January, 2012, Thirty Two years after the Qom riots that sparked the Islamic revolution in Iran, Naval Commander Hossein Alaei, wrote an article to commemorate the Qom uprising. Former Naval Commander Alaei is the founder of the IRGC Navy forces in 1985 and a prominent war time commander. Apart from the head of the Navy, he has also been the head of Combined Armed Forces, head of the Aeronautical Industries and is a member of the Imam Hossein university scientific committee, where Islamic Republic officers are trained. Alaei's article to commemorate the Qom uprising was on the surface addressing the Shah, but Iranians are too familiar with these similar improvisation tools that Iran's poets have used over centuries to speak the unspeakable. 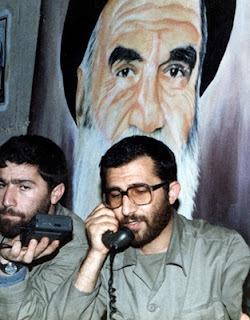 It was clear that Commander Alaei was not just addressing the Shah and was referring to the present situation in Iran. Alaei finishes his article with this Koranic verse : "فاعتبروا يا اولي الابصار"
So learn the lessons, you men of vision"
See the translation of the main parts of the article at the bottom of this post. It took one day for the Commander to fall from hero to zero and the hardline papers and newspapers started their campaign to vilify the former war hero. Baseer (Insight) site called him a despondent element who had cut his former ties and relied on his track record at the front, during the war, to act as his shield. Raja News also berated him and compared him to the author of the article in 1978 that set off the Qom riots. Fars, also accused Alaei for drawing parallels between then and now and said Alaei and his hypothetical questions from the deposed Shah is an attempt to compare the crackdown then with that of the recent 'sedition'. Some of the other news sites which had copied the original article quickly removed the article. But it is never enough to just write against a person who dares to criticise the Supreme Leader, physical threats usually continue next, and true to form, hardline newspapers are reporting hundreds of "mourners" marking the 40th day after the anniversary of Imam Hussein's martyrdom, have gathered outside Commander Alaei's house, chanting slogans against him. "Commander Wake up! ", "Commander Alaei, You Have Failed", "Alaei, Shame on You, Shame on You". “9 January 1978 is the beginning of a popular and pervasive uprising which, in about a year, was able to expel the Shah from the country and bring an end to 2,500 years of monarchy in Iran,” Alaei writes. “But this incident was ignited very easily, and the regime itself provided the pretence. Alaei then raises a number of questions he says the Shah “probably” pondered after being forced into exile, questions that might serve as an “important lesson for others. With Burma finally waking up to the sense that you must Reform in today's modern world, only greedy ego-maniacs and power hungry thugs would want to plunge their country futher back into the like's of North Korea. And yet that's precisely what Iranian's have currently got! Caught between the decrepid clergy and the gangster dons of the military, do Iranians really want to become just the surreal slaves of Kim il-Khamaneni, or isn't it about time they ALL remembered the call of 'Azardi Irani' again??? The black vulture Stalin of Iran should've been put in jail years ago! Not still be making a joke of you all by lording over you with his smug demonic ego and blood-soaked billions! You Potkin are as much to blame for the crap in Iran as any of the young idealists who since live in Britain, America or moved to Canada infested with Xrevolutionary guards pretending to be against the regime. YOU potkin still supporting Karoubi, mousavi? How is that hopey changey feeling working for ya? Still hopeful the molas and their garbage will be replaced by reformed Islam kind that YOU and Iranians want? Hey Winston, yah man, Fox news channel is garbage dude, watch it as you do. No need to think you are any different now to the hellhole you came from before some gullible American idiot, supported you to be sitting in Canada now. Posting youtube vids on your blog about Pahlavis have never fooled anyone. Sure you already know. Pahlavis are total goners too now. That you know too.